Why Brontosaurus being back challenges my ability to change my mind. Ok, here’s the thing. I grew up dino-crazy. From the time I was in 3rd grade onward, I had a love for the prehistoric beasts we know as dinosaurs. I’m not saying that a lot of kids don’t come down with dino-fever when they’re little (it is a common childhood illness after all), but it seems that for the vast majority of people it is a mild self-limiting disorder that is really nothing to worry about. I didn’t fall into the category with the majority of inflicted, I was in the small percentage of patients where the condition became chronic. There is an even smaller percentage of chronic dino-fever sufferers that go on to become paleontologists (so yes, there are some out there that have it worse than me). I didn’t grow up to become a paleontologist, like I thought I would in 3rd grade, but I continue to have an interest in learning more about my extinct darlings (all extinct that is except for the avian variety – birds!). Of all the dinosaurs I knew about in 3rd grade – and there are a lot more known today than there were then – brontosaurus was definitely one of my favorites. It would certainly be amazing to be able to see what a living animal would have looked like. Here’s hoping for Jurassic Park or Jurassic World technology one day – minus the rampaging raptors and out of control T. rex, of course! Brontosaurus was one of the long-necked dinosaurs or sauropods. They were a varied group and some, like brontosaurus, grew gigantic. The sauropods were the biggest land animals to ever walk the earth. Only blue whales are larger, and those whales are cheaters (literally, the “biggest” cheaters) because they use the buoyancy of the salty ocean water to prevent their tremendous weight from crushing the life out of them. Not good old brontosaurus, they were built to take it. In case you haven’t noticed, whales don’t last too long on dry land. 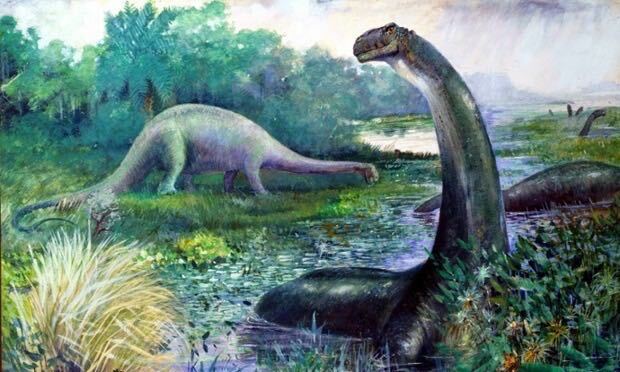 Back in my day (you know 3rd grade) we thought that brontosaurus probably had to live in lakes and other bodies of water to support their mass, but over the last few decades it has become clear that isn’t so. They roamed the dry land in herds. Their legs and backs had to hold up under the unrelenting gravity of planet earth. Their lungs had to expand to fill with air and their hearts had to pump blood through a super long neck leading to a brain (alright, so it was a tiny brain) with the weight of their own tissues constantly trying to flatten them. A pretty impressive physiology had to be set in place by the wonder of evolution, and it is amazing to speculate on what environmental pressures lead to such crazy gigantism through natural selection. So what does all this have to do with brontosaurus being back, or me having a tough time changing my mind? Well, back during my paleontological training in 3rd grade, brontosaurus was the most famous of the sauropod dinosaurs. We did know about sauropods like diplodocus and brachiosaurus, but brontosaurus was the one most often portrayed in drawings and paintings. Little did our young minds realize at the time, but there was a scientific controversy on the nomenclature of brontosaurus. It seems that brontosaurus was named by the famous paleontologist Charles Marsh in 1879, but Marsh had already named a different skeleton of sauropod Apatosaurus in 1877. Marsh, of course, thought that these two animals were different kinds, but in 1903 another scientist, named Elmer Riggs, studying the fossils, concluded that the two specimens were, in fact, one and the same species. Even though Marsh was the discoverer of both specimens, the rules of dinosaur nomenclature state that the first named is the true name. In other words, there was no brontosaurus, just apatosaurus. Scientists had known, and basically accepted this since 1903, but it didn’t seem to trickle down to the general public until a long time later. I’m not really sure when it became generally well known that brontosaurus was out and apatosaurus was in. It may have been the 90s or early 2000s. All I remember was being devastated that brontosaurus was no longer a thing! The name was already well engrained in my mind, and it seemed annoying to have to now call brontosaurus, apatosaurus, but I was already scientifically trained by that time and was willing to do the right thing. I began using the name apatosaurus when talking or thinking about the great beast. Now new research has revealed that the bones of brontosaurus and apatosaurus really are two different kinds of animals. So, just this year, brontosaurus is back after 112 years of mistaken identity. When I saw the reports of the research teams conclusions I was overjoyed. Yay, brontosaurus is back! I love you brontosaurus! Then the joy I felt at going back to a well engrained fact made me think about the difficulty humans have changing their minds. The cognitive strain caused by having to accept new facts as true, and our emotional need for a stable, unchanging view of the world. Darn, there are no free lunches after all! Changing gears just a bit from the bones of the Thunder lizard to the frontal cortex of the “wise man” (Homo sapiens), research in cognitive psychology by nobel laureate Daniel Kahneman reveals that we rely on two systems to construct our view of reality, and to update that view as new information is processed. These systems are called system 1 and system 2. So much for creative naming. System 1 is our quick thinking system. It is similar to intuition or a gut feeling. You don’t really have to think about the situation, the answer just comes to you. Some of it is just evolutionary programming that is triggered by certain stimuli, like face recognition for example. It allows us to rely on certain heuristics that may be right a lot of the time, so we can make snap decisions. System 2 on the other hand is our slow thinking system. It is dependent on more careful thinking and consideration to detail. Applying statistical analysis or the scientific method to a problem would draw on system 2. Unfortunately, system 2 is slow, expends a lot of mental energy, and is therefor expensive from a survival point of view. In reality we use both systems everyday. I think that since I learned about brontosaurus from such an early age, I formed a sort of heuristic of recognition when I saw or read something about apatosaurus. There was a cognitive strain associated with placing apatosaurus in the memory location where brontosaurus was supposed to live. The article that validated the uniqueness of brontosaurus as it’s own species gave me a sort of permission to use my old tried and true heuristic for recognizing the creature – much like recognizing a familiar face of a friend or celebrity. A relief of the cognitive strain meant that I didn’t have to rely on system 2 each time to draw upon the fact that there is no brontosaurus, only apatosaurus. This seemed a bit disappointing to me, since I consider myself someone who values system 2 type thinking a lot. And this was only about the name of the brontosaurus. Think of all the many beliefs deeply embedded in our minds due to having been placed there from an early age. It makes it difficult, though fortunately not impossible, for us to self-examine facts that we take for granted. But science teaches us that individual facts are updated, revised, and sometimes even completely changed as new evidence accumulates. This is not how our system 1 evolved to interpret the world our distant ancestors woke up in. The things our intuitions inform us of, that seem like common sense, are not always a good model of truth. Getting my brontosaurus back told me that it is really hard to change your mind and update your model of the world. Being open to change means feeling comfortable with some degree of uncertainty. Not an easy thing, but something we can train ourselves to get better at accepting. I was lucky this time, but the next beloved fact that is overturned will probably not be set back to zero again. Oh well, I’m a scientist and I will continue to try my best to embrace the changes that are coming as science sheds new light on our world. In the meantime, welcome back brontosaurus, I missed you!